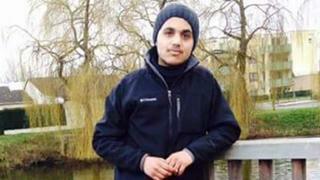 A man who died in a crash in Oxfordshire was a Kurdish refugee travelling underneath a lorry, a charity has said. Help Refugees said the man, who was killed in Banbury in the early hours of Friday, was trying to reach relatives in the UK. The charity said Mohammed Hussan, 18, had been living in a refugee camp in Dunkirk for six months. A spokeswoman said he was trying to get to an uncle in Manchester. Maddie Harris, a charity volunteer at the camp, said when the man's cousin and another uncle, who were still in Dunkirk, tried to call his mobile phone on Friday evening, it was answered by police. She said: "The police answered and I was asked to speak to them. "He was underneath a truck, there was an accident and he was killed. "He'd been in Dunkirk a long time - maybe he decided to go on his own. "The problem is, we are aware of Mohammed because he was known in the camp, but how many more people has this happened to?" Thames Valley Police would not confirm the identity of the man who was killed, but said his next of kin had been informed. A man arrested on suspicion of causing death by careless driving has since been released without charge. The crash happened at 04:35 BST in Banbury on Beaumont Road, at its junction with Southam Road. The charity says it believes Mr Hussan is the first refugee to be killed on British soil in 2016.